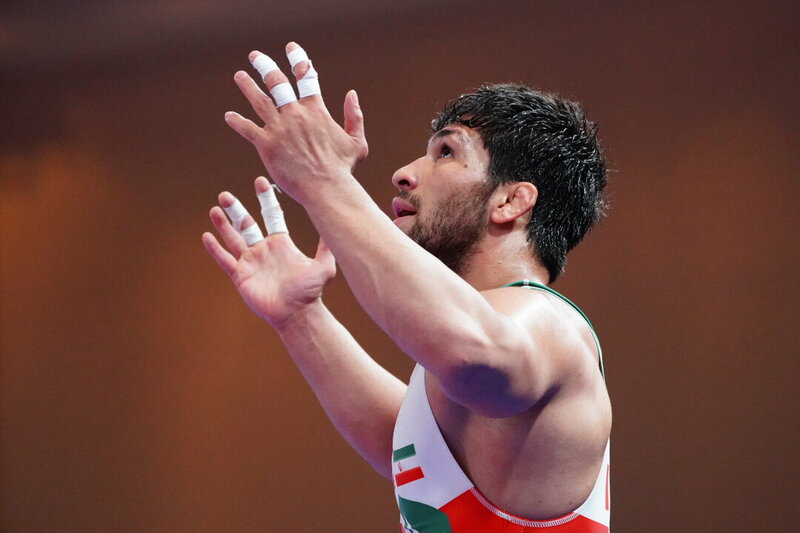 For most countries, four medals in four weight classes would be cause for celebration. But not if you're the Japan women's team and none of those medals are gold, particularly with two world champions in the competition--neither of whom made it to the finals. Instead it was Mongolia, North Korea (twice) and, for the first time ever, India who had cause to smile as the women's wrestling competition at the Asian Games got underway Monday on the second day in Jakarta. Orkhon PUREVDORJ (MGL) pulled off the feat of the day when she won a clash of world champions, scoring a victory by fall in the 62kg semifinals over Risako KAWAI (JPN), who is also a reigning Olympic champion and had not lost in nearly three years. Purevdorj followed that up by crushing Aisuluu TYNYBEKOVA (KGZ) with an 11-0 technical fall in the final to add the Asian Games gold to the 2017 world championship she won at 62kg in Paris. Tynybekova is no slouch herself, having won the Asian gold and a world bronze medal at 58kg in 2017. But she was no match for Purevdorj, who has now won 10 consecutive international tournaments, including the gold at the Asian Championships in Bishkek earlier this year. Purevdorj also holds the distinction of being one of the few wrestlers on the planet to have beaten four-time Olympic champion Kaori ICHO (JPN), having scored a technical fall victory over the legend in the final at the Yarygin Grand Prix in 2016. In the semifinal against Kawai, Purevdorj was trailing 2-0 in the second period when she sent the Japanese to her back and finished her off with a fall at 3:47. The devastated Kawai spent a long while after the match sitting against a wall sobbing. "I was caught off guard in an instant," Kawai told the Japanese press. "That is the fear of wrestling." Kawai managed to compose herself and return for the bronze medal match, where she easily disposed of Thi My Hanh NGUYEN (VIE) by 10-0 technical fall in 2:58. RIM Jong Sim (PRK) snared the other bronze. Kawai, who won the Paris 2017 title at 60kg and Rio 2016 Olympic gold at 63kg, will drop to 59kg in an attempt to defend her world title in Budapest in Hungary. So for now, there will be no rematch for Purevdorj. For Yuki IRIE (JPN), a rematch with Vinesh VINESH (IND) produced the same disappointing result, but this time at a higher cost. Meeting in the 50kg final, Vinesh took a 4-0 lead in the first period, then held off the Japanese national champion for a 6-2 victory. That was similar to the outcome of their semifinal encounter at Bishkek 2018, where Vinesh won 4-4 on big point en route to the silver medal. Irie won a bronze. The victory made Vinesh, who knocked off Rio 2016 bronze medalist SUN Yanan (CHN) in the first round, the first Indian woman in history to win an Asian Games wrestling gold medal. It was against Sun in Rio that Vinesh suffered a serious leg injury that scuttled her Olympic hopes. KIM Son Hyung (PRK), a bronze medalist at Paris 2017, and KIM Hyungjoo (KOR) won the playoffs for the bronzes. For Irie, falling short of the gold was a particularly hard blow as she missed out on making Japan's team to the world championships. She defeated world champion Yui SUSAKI (JPN) at the national championships in December to earn a berth to Jakarta, but subsequently lost out to Susaki in a playoff for Budapest. Japan's other current world champion in action in Jakarta, Haruna OKUNO, was also tripped up on the path to the final, suffering a heartbreaking 7-7 loss in the 53kg semifinal to Bishkek 2018 champion PAK Yong Mi (PRK). Okuno, the Paris 2017 gold medalist at 55kg, trailed 4-1 after the first period, but fought back to go ahead 7-6 with 30 seconds left---only to give up a point for stepping out in the last five seconds to concede the victory on last point to Pak. Pak went on to win the gold with a one-sided 11-0 technical fall in 5:29 over Zhuldyz ESHIMOVA (KAZ), a Bishkek 2018 bronze medalist and New Delhi 2017 silver medalist. 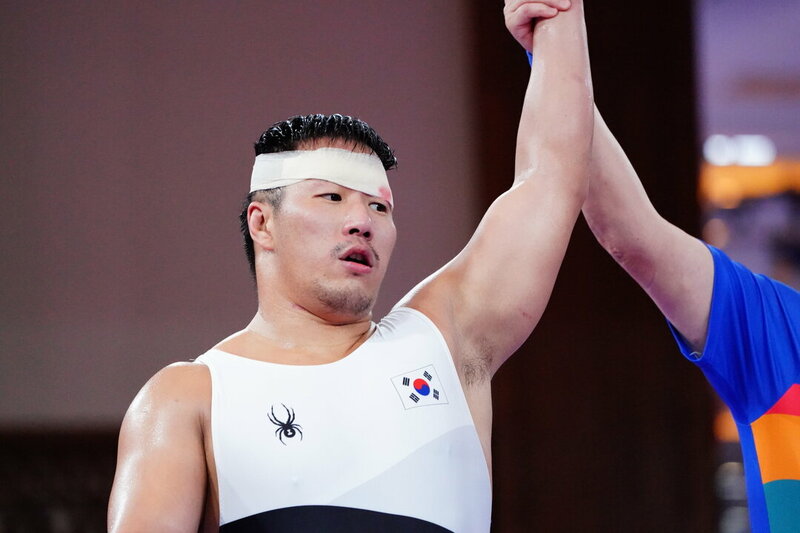 Okuno and Sumiya ERDENECHIMEG (MGL), the runner-up to Pak in Bishkek, took the bronze medals with first-period falls in the third-place playoffs. 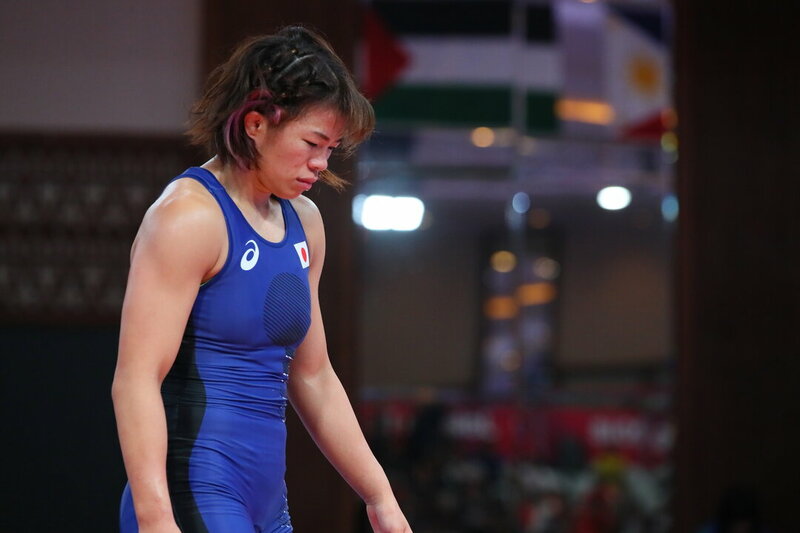 The semifinal losses by Kawai and Okuno came on the heels of a loss at the same stage in freestyle 57kg by fellow world champion and compatriot Yuki TAKAHASHI (JPN) the previous day. JONG Myong Suk (PRK) gave North Korea its second gold of the night when the two-time world bronze medalist scored a 5-4 victory in the 57kg final over Bishkek 2018 champion PEI Xingru (CHN). Jong chalked up four points with a double-leg takedown in the first period, then held on as Pei battled back with her own 4-point move in the second. The bronze medals went to Battsetseg ALTANTSETSEG (MGL) and Katsuki SAKAGAMI (JPN). 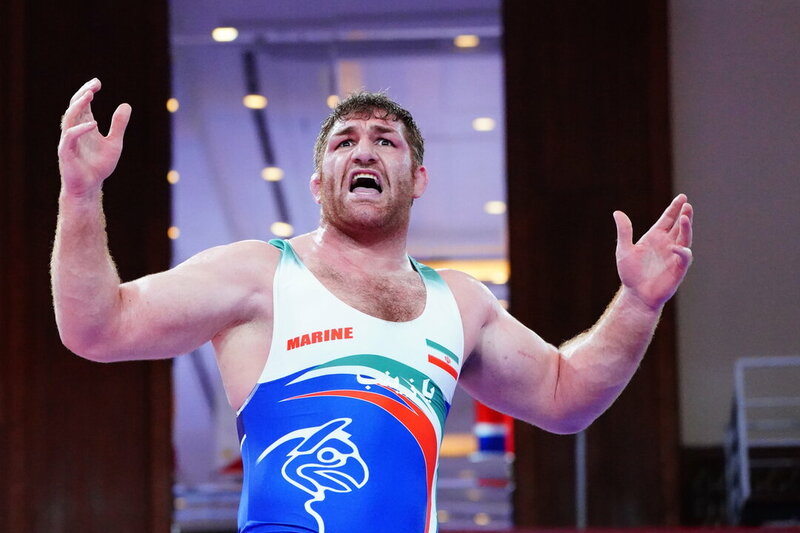 Meanwhile in the lone remaining weight class in freestyle, Parviz HADIBASMANJ (IRI) successfully defended his 125kg title to give Iran golds in the top half of the six divisions on the program. 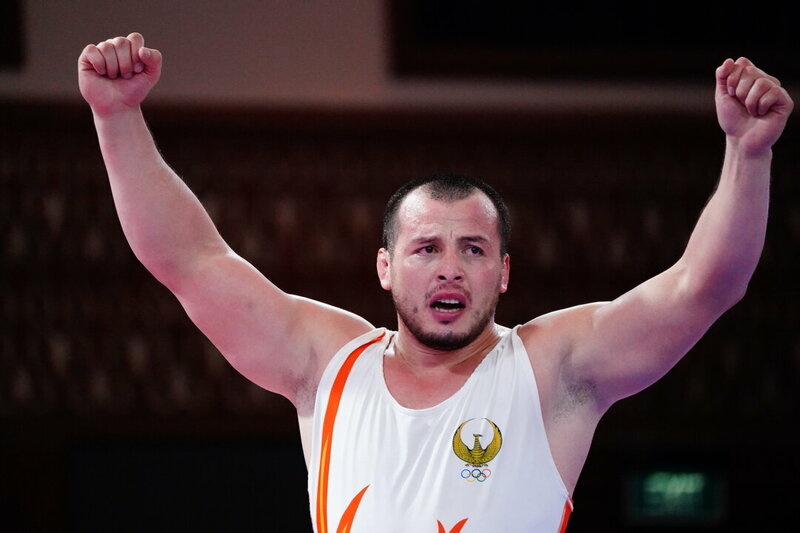 Hadibasmanj had little trouble in forging a 7-0 decision in the final over DENG Zhiwei (CHN) to add to the golds won the previous day by Iranian compatriots Hassan YAZDANI at 86kg and Alireza KARIMI at 97kg. Hadibasmanj's biggest challenge came in the semifinals, where he managed to scrape together an 11-8 win over man-mountain and Bishkek 2018 champion Davit MODZMANASHVILI (UZB). Modzmanshvili and NAM Koungjin (KOR) came away with the bronze medals. On Day 3 of the four-day competition on Tuesday, the women will finish up with the two upper weights, 68kg and 72kg, while the Greco-Roman gets started with the two lightest divisions, 60kg and 67kg.